We have definitely noticed an increased demand among our customers for free from foods. In our store we stock a wide range of free from products, from gluten-free bread, flour and pasta to dairy-free milks and spreads. Our most popular free from products tend to be gluten-free crackers, crisp breads and cereals. In our salad bar we always make sure we have a vegan option and a gluten-free option. I also make my own healthy flapjacks called Katjacks and we’ve brought out a gluten-free option for them too. Our customers want free from foods for a variety of reasons. Some need to cut out gluten because they have coeliac disease whereas others feel healthier without it in their diet and so choose to follow a free from diet for improved health and wellbeing. A lot of celebrity chefs are now bringing out vegan and gluten- and dairy-free recipes which is catching people’s interest. We get a lot of people coming in asking for gluten-free flour as they are interested in making their own gluten-free bread. We stock a wide range of flours made from ancient grains such as quinoa, buckwheat, teff and millet. In fact there is a big interest in making food from scratch in general. There is a move away from refined and processed foods that are full of gluten and dairy towards more nutritious, vitamin-rich foods. Dairy-free products are popular among our customers too. We have noticed a number of parents buying dairy-free milk for their children, especially if they have suffered with eczema and asthma. They are finding that avoiding dairy can often help to ease their children’s symptoms. We stock a range of alternative milks from coconut and almond to rice, oat and hemp, which is becoming particularly popular. Soya milk is becoming less popular because of the amount of oestrogen it contains. It’s fine in small quantities but I think people are realising that it’s not a good idea to have it in large quantities. The quality of free from foods is improving all the time, and there is much more choice now for consumers. We have noticed that the packaging has become more innovative and attractive too. Although the products tend to be more expensive, customers are prepared to pay for them as they want good quality free from foods. We are always happy to offer help and advice to customers when it comes to choosing products – just ask and we will be pleased to help! 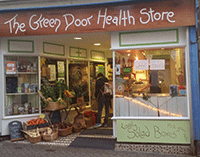 The Green Door Health Store is based at 10 Tregenna Place, St Ives, Cornwall, TR26 1SB. The store has been established for around 20 years but Kat took over the ownership two years ago. The store’s motto is: ‘opening the door to health, fairness and an ethical way of thinking’. The store stocks a wide range of products from wholefoods, superfoods and free from foods to vitamins, minerals and supplements and natural and organic beauty products. Local suppliers are well supported as the store stocks gluten-free bread, jams, honeys and raw chocolate made by local businesses. There is a range of salads, sandwiches and hot food to take away.